The solderless breadboard recommended (and provided for DC2008) is configured as shown at right. Insertion points are connected in groups of 5. Solid conductor wire or component leads work well in the insertion points. Stranded wire will be unreliable. 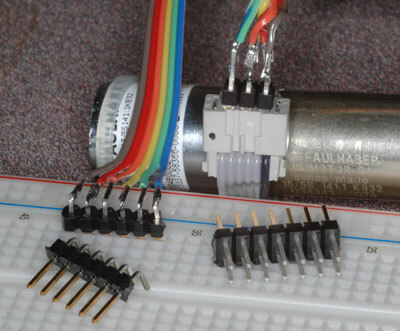 Most IC chips can span the central gutter so that each IC pin is accessible as a group of 5 insertion points, only one of which is used up by the chip. There are four long rails, with all connection points in each rail mutually connected. 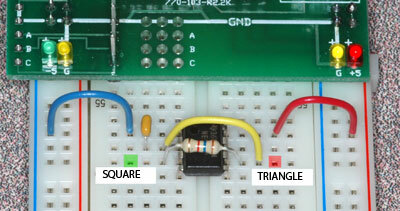 (Some breadboards break these rails up into smaller connected chunks.) It's common to use the red ones as +5 rails and the blue ones as ground rails, though you can use them for anything if you don't get confused. The two red ones are not connected to each other, nor are the blue ones, unless you jumper them. Don't use alligator clips; instead run a length of solid wire out from the test point in question, to your clip. Neatness really counts. If you invest some effort in neat wiring it will pay off in easy debugging. If you don't, what you think are electronics problems will turn out to be frustrating wiring problems. Cut wire to the right length, with 3/8" of exposed conductor. When the end gets kinked, throw it out. Cut component leads down. Use insulated jumpers (wires) rather than uninsulated component leads, to span distances. Every sensor and actuator is going to need a long (off board) cable running to it. This should be stranded wire, not solid wire, because solid wire breaks if it gets flexed too much. 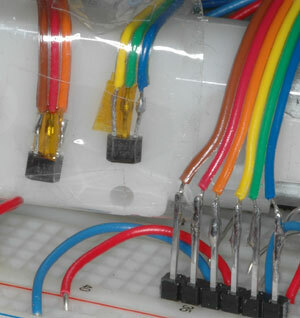 You can use ribbon cable very conveniently for Hall switches, optoreflectors, and even 2-lead components like LED emitters. The flexibility of the wire and that the conductors don't get pulled apart will keep your components leads from getting bent and then broken.